Early spring watch for the European pine sawfly. 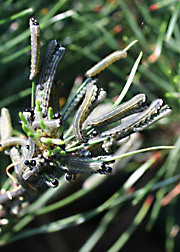 If branches on short needled pines such as scotch and mugo pine appear to move when you walk past, it’s probably a mass of European pine sawfly larva. They will feed on last year's needles, so will disfigure pines but most likely won't kill them. 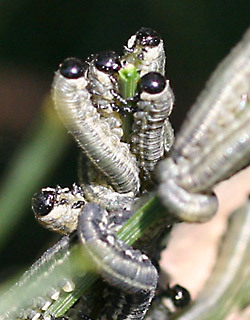 Control pine sawfly larva with most general purpose insecticides except Bacillus thuringiensis as soon as they appear. Instead of spraying insecticides, another possible option is to knock the larva off the branches with a stream of water or remove them by hand. Don't cut off infested branches, as the terminal bud will be removed and new growth will not appear on that branch. 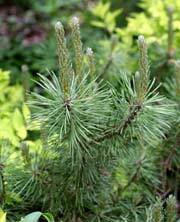 Pines should only be pruned by cutting back the new candle growth, which typically appears in June. 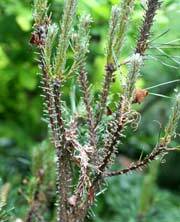 Damage after Pine Sawfly infestation.